Weddings are so not her thing. Unless she expects to actually get married. While Maisie’s mother wants her daughter to have the perfect wedding, Maisie is more concerned about just tying the knot and living happily ever after. But that ends up being no simple thing, especially when the church encounters a possible disaster. And two of the guests are Senator Coraleigh Boyle and Clay London, two people who supposedly hate each other. 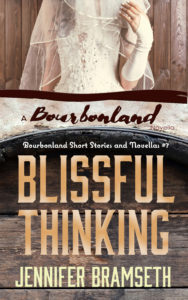 Blissful Thinking, a 35,000-word novella, is the seventh story in the Bourbonland Short Stories and Novellas Series, and takes place during part of White Dog (Bourbonland Short Stories and Novellas #6) and after Executive Liaisons (Bourbonland Book 4). Release date: May 14, 2019.